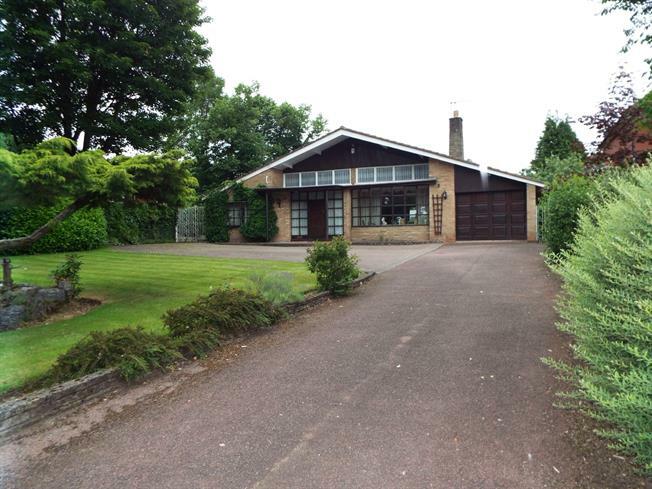 3 Bedroom Detached Bungalow For Sale in Cannock for Asking Price £700,000. This remarkable three bedroom individual detached bungalow is tastefully designed and charming throughout. The property comprises of; living room, kitchen, three double bedrooms, shower room and en-suite to master bedroom. Externally there are breath taking gardens front and rear, access to outside toilet, boiler room, utility and garage. The property also has off road parking for several vehicles. This property has potential to obtain planning permission for further development or extension. Please call now to avoid disappointment. Double glazed wood window. Radiator. Roll top work surface, wall and base units, one and a half bowl sink, integrated oven, integrated hob, over hob extractor, integrated dishwasher. UPVC patio double glazed door, opening onto the garden. Double glazed bay window. UPVC sliding double glazed door, opening onto the garden. Radiator, fitted wardrobes. Double glazed wood window with obscure glass. Radiator, fitted wardrobes, spotlights. Low level WC, jacuzzi with mixer tap, vanity unit with mixer tap. Double glazed wood window. Radiator, fitted wardrobes. Double glazed wood bay window. Radiator. Double glazed wood window with obscure glass. Radiator, spotlights. Low level WC, single enclosure shower, vanity unit. Single glazed wood window. Radiator, fitted wardrobes. Roll top work surface, wall and base units, stainless steel sink, space for washing machine. Loft access that is partially boarded with loft ladders and light. Double glazed wood window. Electric points and light. Space for storage of garden tools and furniture. Low level WC and light.